The price for the product in the minimum configuration of a latex type Supatex, 0.33 mm thick. Full front 3-ways zipper - Zipper with 3-ways from the tailbone through crotch and up to the top of the front collar. Full back 3-ways zipper - Zipper with 3-ways from the navel through crotch to the top of the back of the collar. We do not recommend this option. Schoulders and crotch zippers - Two zipper from the top of the collar to the shoulder seams and zipper 30 cm with 2-ways through the crotch. Back short zipper 1-way, to the waist - Zipper with one-way from the top of the collar back to tailbone. Concerning the the choice of color should be zipper noted that almost none of the zipper color we offer, in addition to black and red, not exactly coincide with the main color Catsuit. And if we are talking about Catsuit translucent latex, and there is worse: zipper will show through the base material, and there will generally be a mixture of colors. Universal colors that are suitable for everything: black, gray and white. At the same time, in our opinion, if the color of zipper does not coincide with the main color, the zipper should be darker than the base material. On the product of semi-transparent latex recommend ordering beige zipper, similar to the skin color. 2. Why do we recommend a zipper in the front, not the back? 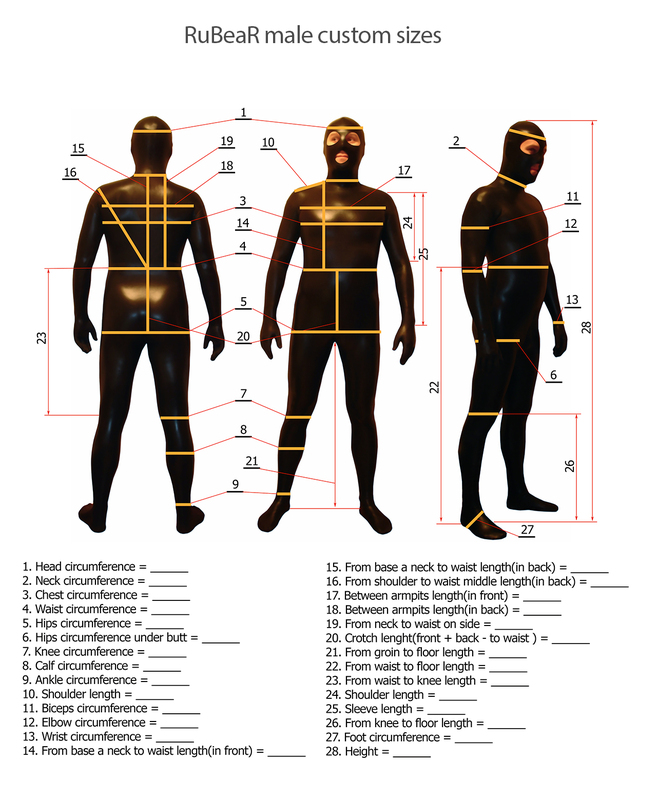 Try to take a tape measure or tailor centimeter and measure at the length of the line running from the navel to the groin and through the cervical vertebra. Do it in a standing position and in position leaning forward. You will find that this line is a person standing directly on the 7-8 cm shorter than a man bending down. So, in Catsuit made in tight with zip behind you can neither sit nor bend, because the zipper in contrast to the rubber does not stretch. This practice is checked. There is another argument against small zipper at the back: you will not be able to button on a suit without assistance. 3. Can we glue to the Catsuit gloves, socks, a mask? Yes, look at the options. 4. How to care for Catsuit? After manufacturing Catsuit comes to you lubricated with talc. Before the first putting on, wash Catsuit in washing powder. Apply silicone oil on the Catsuit. And after each use, Catsuit thoroughly rinsed in water and dried at room temperature. After rinsing the silicone oil is still in the suit, and it does not stick together.